The radiator is a major part of an engines’ cooling system. Its function is to use the coolant that passes through the vehicles’ cooling system to regulate the engines’ temperature , just like how the heart is responsible for distributing oxygenated blood to different parts of the body. The importance of this process is to prevent the engine from overheating and malfunctioning which is a similar result as when there is a leak in the radiator. The quick fix for this involves the use of the best radiator stop leak. It is important to note that this is not a permanent solution for coolant leaking problems but it will serve you till you can get a permanent fix at the nearest service center. Technically, a stop leak prevents the radiator fluid from leaking out through whatever punctures might have caused the leak in the first place. Even so, an overuse of even the best radiator stop leak can damage or clog the radiator itself. Therefore, you need to read the manual provided with the purchase and understand how to, and how much to use to be safe. The K-Seal leak repairer makes sure that coolant leaks don’t result in costly repair bills. Its ability to do so lies in its contents which include a blend of specially developed ingredients such as copper particles and ceramic microfibers. When ingredients such as these are added to the cooling system, they are dispersed freely around the cooling system by means of the coolant’s flow and stay suspended at strategic points in the valves. With the leak repair present in the cooling system, when there is a leak either internally across the head to the cylinders or externally through a puddle under the engine, the K-Seal will follow the leakage through the crack or hole and fix the leak by clogging it. Leaks are mostly portals to air filled mediums, and when the leak repair comes in contact with the air, it clogs till filled up. The interesting thing about this stop leak product is that it is very easy to use. All you need to do is to shake it thoroughly while in the bottle (so that the ingredients mix properly), and then pour it into the coolant tank and you’re good to go. Also, it mixes well with all antifreeze products without the need for draining or flushing. It is scientifically tested and trusted by millions of customers worldwide that have found that using it has no adverse effect on the efficiency of the engine when used properly. The Bars’ Leaks brand are a team of enthusiasts with about seventy years of experience in automobile repairs driven by their passion to help drivers at all experience levels to get fast and affordable fix-products that fit in to their lifestyle and budgets. The two major ingredients of their best radiator stop leak product are the Xtreme cool and the liquid aluminum, which is a part of the next generation line of stop leak ingredients that stop leaks and condition the system. This combination takes care of the leaking problem and ensures that future issues associated with heater core leaks and coolant leaks are prevented. It can be installed in an existing antifreeze coolant as it is designed to coexist by direct addition to the coolant without flushing out the antifreeze. However, if you intend to use it with water (if water is your coolant), the manufacturer recommends that you add another bottle of liquid aluminum to the system after installing the antifreeze. Apart from water, Bars’ Leaks stop leak works with other coolant types including both silicate and non-silicate based ones. In most cases, the leak will most likely be sealed within the first 20 minutes of application if not instantly. Therefore, you need to idle/drive the vehicle for 10 to 20 minutes after use before the changes are effected. 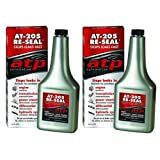 The composition that makes up the AT-205 ATP leak stopper is user friendly to rubber seals and gaskets of all types, so you don’t need to worry about self-destructing effects from its use. It works by rejuvenating the radiators’ seals and/or plugging the holes within the cooling system. The fact that it works well with hydraulic fluids, gearing oil, steering fluids, conventional and synthetic oils proves that the stop leak features an excellent versatility and compatibility rating. Therefore, it can be used in all areas of the vehicles’ engine that has fluids. More importantly, it does not contain any petroleum distillate which as an extension means that it doesn’t swell and as such cannot break the seals. It possesses professional strength which translates into speedy and effective restoration of the leaky valves. Overuse of stop leak tends to clog the radiator valves; therefore, it is important to use according to the dosage recommended by the manufacturer which in this case is an 8-ounce bottle for a 6-quart capacity. The best part about the ATP leak stopper is that given its effectiveness, it is very pocket friendly therefore making it a quick and cheap fix to the problem of leaky radiator valves. Bar's Leaks 1109 Block Seal Liquid Copper Intake and Radiator Stop Leak - 18 oz. The Bars’ Leaks 1109 works in even larger leaks such as those in cars, trucks, SUVs and RVs. If they are powerful enough for cooling systems in such big engines, then they’d be efficient just about anywhere else. The formula creates a semi-permanent solution for the large leaks in radiators, gaskets, heater cores, freeze plugs an even intake manifolds. It is compatible with the antifreeze solution therefore while in use, it does not drain or flush the antifreeze. The formula is a combination of the Xtreme Cool additive and Liquid aluminum, which increases the wetting ability of the coolant thereby reducing its surface tension. As an extension, the heat transfer helps to reduce the temperature of the coolant and helps prevent overheating and leaks which are mostly due to overheating. When used properly, the cooling system will be preserved, and effects otherwise for overuse. So, it is important that you adhere to the instructions by the manufacturer. The dosage is one bottle for regular sized cooling systems such as engines with 4 to 10 cylinders. For smaller cooling systems, half of the bottle is recommended. On a more general note, one bottle is recommended for every six gallons of cooling system capacity. Conclusively, Bars’ Leaks has been considered to be a more permanent solution to leakages in the cooling system as well as a perfect maintenance solution to the system. This coming at an affordable price all the more makes it worth your consideration. Bar's Leaks PLT11 Pelletized Radiator Stop Leak - 11 oz. Our particular interest in the Bars’ Leaks brand is the ability of their products to have other functions apart from just repairing the leaks. The PLT11 in this case contains ingredients that help inhibit corrosion and rusts, act as a lubricant to the water pump seals and most importantly help control electrolysis, as an addition to its main function which is to repair leaks in the cooling system. In addition to being pretty versatile as explained, the PLT11 is particularly recognized for being able to fix even larger leaks which would normally require the expertise of a mechanic or complete change of the radiator parts. It is readily present in any area of the vehicle where fluids are present and as such seals internal, external and even coolant-to-oil leaks. Its versatility extends to the types of radiators in which it can be used as it promises safety and effectiveness on metal, aluminum and even plastic radiators without causing any compromise on the operations of the vehicles’ engine. This easy-to-use powder formula features a non-rust technology which ensures that the possibility of rusting due to the exposure of the valves to leakage are minimized. It does not require the expertise of owners with advanced automotive knowledge so, as long as you follow the instructions, you will be totally fine. There are certain purchase considerations you need to take into account before going through with your purchase. These concerns determine whether the product will be effective in your cooling system, whether the product is compatible with the kind of coolant you use, or even whether or not it is safe to use with your engine. Therefore, these questions have to be answered before you click that “buy” button. There are various leak-stop chemicals used in different products and the ingredients of such chemicals determine whether or not they will work for your cooling system or are even good for your engine. In most cases, the chemicals include Xtreme Cool and liquid Aluminum which are quite generally safe and boasted of in products such as Bars’ Leak. However, you still need to check for other ingredients combined with them and be sure that your engine is in good hands before use. You could take a cue from the reviews from verified purchases. They are mostly right and quick to vent their anger. Leak stops are not only applicable to the coolant area, but to other areas of the engine with fluids and valves, one of which is the heater core. You have to be sure that the product will flow through these areas and fix the leaks without compromising their operation in any way. Some leak stops cancel out the effects of antifreeze because of the conflict of craftsmanship employed in its manufacture. Make sure that the stop leak you decide to get can coexist with the antifreeze without reducing its effects and compromise the operation of your engine indirectly. Conclusively, makes sure that whichever product you decide to buy is fully compatible with your engine’s coolant system. Otherwise, there’s no point in spending extra. See Also : What is AdBlue? Stay tuned to Carlysis for more product reviews.